Right now, it’s not clear how far the present government is actually to blame. 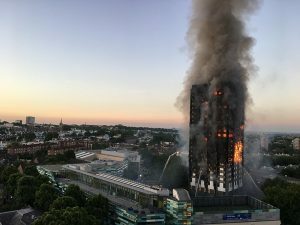 At its crudest, whether we elected a Labour or a Conservative government on 8 June would have had no bearing on this terrible fire, but the anger being shown to the government says something much broader about what is going on in the country, particularly in terms of a failure of leadership. The Queen and Prince William made a visit. People who felt ignored found a monarch and a future monarch willing to meet them and to listen. In Prince William, firefighters found someone willing to recognise their trauma as well as their professionalism. Jeremy Corbyn went. He doesn’t have the national standing of the Queen, but he was present. Like the royals, he came over as human and met people in their shock. Theresa May went but didn’t talk to people. She failed to meet that human need. Policy statements are great, but don’t make the immediate difference that was needed. They don’t engage with people who feel traumatised and grief-stricken. Ministers being interviewed slip too easily between “regulations” and “guidelines” as if trying to evade responsibility. Whether they are responsible is an open question, but attempting to evade responsibility felt like an acceptance of blame. In slightly more psychoanalytic language things look stark. Besides the enormity of the suffering of those directly affected, it points to the instability of political life in the UK at the moment. In these terms, the Queen and Prince William took up an inportant role as in some sense the personification of the nation. But they hold this in a fascinating way. They act as people, in some ways giving a human response on behalf of the nation. But they also represent the law and government (as a concept). Those would usually be spoken of in terms of the paternal function which psychoanalytic theorists suggest is what enables an infant to go from feeling I think so the centre of its mother’s world, to engaging with reality. There is something here about recognising the harshness of reality, not in the brutal sense of “put up with it”, but as a nuanced and paternal way: it’s the royals standing with people in an extremely difficult situation, rather than pedalling the fantasy that if can be magically healed (for example by magic statements on policy). What’s going on around the Theresa May and her administration makes much more sense in terms of what Melanie Klein calls the paranoid schoizod position. Her point was that in the earliest stages of mental life, we are learning to make sense of reality and never quite forget that struggle. Emotions are strong. Things get split into good and bad. Emotions that can’t be talked about get acted out instead. Klein talks in terms fantasy of the mother having a “good breast” (that is there and provides nourishment) and a “bad breast” (whose absence attracts the child’s anger). The child has fantasies of omnipotence: food is needed and food arrives — and there is anger and outrage if it doesn’t. The echoes are fascinating. Theresa May is “bad” because she, as herself and on behalf of her government, is being blamed for what happened. Yet there Is no sense that the outcome would have been different had the election resulted in a change of government, so in that respect, she is not “to blame”. Theresa May is “good” in that she is the government to whom there is an appeal, but “bad” in that she is being treated as if she were to blame, carrying the angry emotions the nation struggles to handle. For those directly affected, these are to do with the fire, but for the rest of us these are about what it symbolises — life and death, the failure of public services, the instabilities and anxieties around Brexit, a “strong and stable” government that is neither of these things. Howard Schwartz, writing about the psychology of political correctness, talks of a “primaeval mother” as the infant’s fantasy of its mother — a useful phrase because it allows for a big gap between that and the real thing. It feels as if Theresa May is somehow expected to “make it alright”, with a sense of that she should “sort everything out”. A baby may have a fantasy of omnipotence because it feels that food can be made to arrive, but what’s being mobilised is a fantasy of omnipotence where there’s anger at May for not doing the things she can’t do. She can’t bring back the people who have died. She can allocate money, but she can’t allocate very much without then being criticised for extravagance or unfairness — so any sum will be wrong. She can’t change building regulations overnight (even though some may want this), and the reality is that changing regulations without enough thought is never a good idea. There’s pressure for remedial action on other tower blocks, but there would be massive pushback if speed turned into unsatisfactory work, or high cost, or actually led to accidents. One of the useful ideas from group relations is that, one of the ways an unexpressed need is expressed in a group of peope is by someone being mobilised to meet that need. Theresa May’s wooden performance in the General Election saw her dubbed the “maybot”, and her performance over Grenfell Tower seems even more emotionally stunted. I’m now wondering whether the swirl of raw emotions that were whipped up by the Leave campaign led the Tories to mobilise someone whose lack of emotional facility would shut down emotion in the collective response. “Strong and stable” makes total sense as “emotionally closed-off”. Jeremy Corbyn’s emotional realness makes a stark contrast. In the aftermath of an emotionally-demanding election, and election result, a tragedy has happened, acting as a lightening conductor for some very raw emotions in the body politic. Grenfell Tower has affected many people who’d never heard of it before the fire. The government’s failure to engage makes sense in terms of a government still reeling from the referendum, and shocked both by the unexpected reduction in its power, and the surge in support for Jeremy Corbyn, finding itself ill-equipped to deal with raw life-and-death emotions. Underlying this, we do have a problem of leadership. At its best, a country needs a leader who can provide a sense of stability in a way that makes honest disagreement possible. The Queen holds part of that – and stepped in to role brilliantly at Grenfell tower – but this is a key part of the role of the Prime Minister. A few months ago I blogged about the problems created by this lack: as we go into Brexit talks, the situation is markedly worse.